“Hey, kid. Do you feel like sharing?” Unfortunately the kid didn’t. Photo taken in Copenhagen, July 2012. 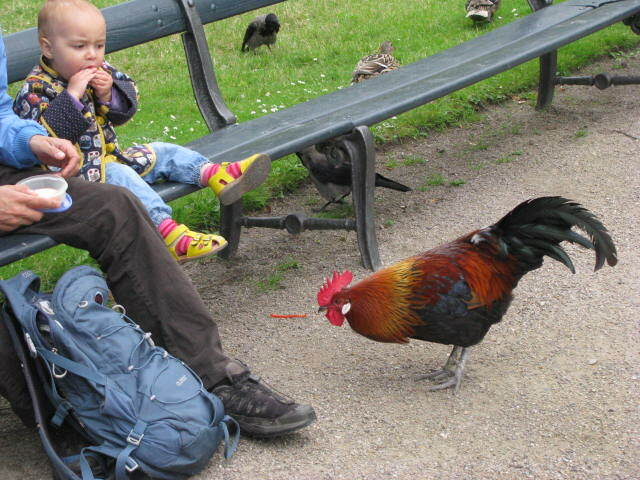 This entry was posted in Travel, Travel Photos and tagged 50 Year Project, Blog, Blogging, Copenhagen, Denmark, Europe, Humor, Kids, Life, Nature, Photo, Photography, Rooster, Travel, Travel Blog, Travel Journal. Bookmark the permalink. He is! a little pushy, but handsome. Those things can be dangerous! I once had one chase me. I haven’t been chased by a rooster, but Miles and I were chased by geese on a regular basis when we lived in Boston. They hated us. Beautiful rooster. Most chickens are attracted to slightly shiny things – things that gleam, like the slimy skin of an earthworm….or an eyeball. We are always very careful with small kids and our chickens. Heck, my glasses have saved my eyeballs more than once while collecting eggs. They peck your eyes…scary. I haven’t been around chickens much. Will remember that. always wear sunglasses. Someone look a tad nervous. what a beautiful rooster! i’ve never seen free-ranging chickens. i’m only familiar with them on farms or as yard birds, cooped up. I’ll keep an eye out for the outfit for you. I am following you and I ought to receive an e-mail whenever you post, but I’m not getting those alerts. Any suggestions for me? I’m so sorry to hear you’ve been having issues. Does the blog show up in your reader at all? That’s how I stay up to date on blogs. Let me know so I can try and work something out. Maybe try unfollowing and then sign up again. Again my apologies for the troubles and thank you for letting me know. Oh dear me, I wasn’t checking my reader! I was relying on a notification at my e-mail address. I learned something new today:-) Thanks for replying and helping me out. I’m glad I could help. It’s all a learning process and trust me, I’m still learning. that’s what makes it fun. Very true 🙂 I don’t like to share much either though. I don’t think I’ve ver seen someone feeding a rooster in a park! Cool!